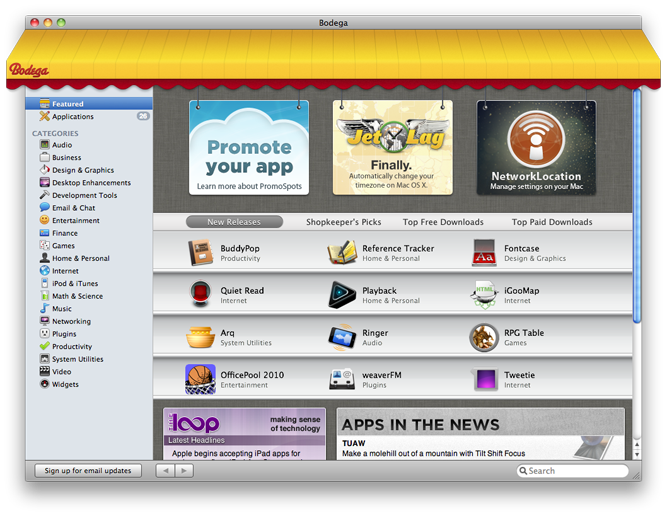 Bodega, launched in 2011, was an alternative Mac App Store containing thousands of apps. It was created to offer an alternative to the Apple experience, which is very constraining for developers. If you had an app that, for whatever reason, wasn't able to get into the Apple App Store then you had two choices: change the app to make it fit Apples guidelines or release it yourself. The first option could mean watering down the app and making it less helpful for users, while the second option would mean very little exposure for the app. Neither option was suitable. This provided the impetus for Bodega to provide a platform for these developers and users who wanted an alternative to the Apple App Store experience. The Bodega platform was not a website; rather it was an app run directly from the Mac desktop. The store made discovering and browsing new apps easy, even delivering the latest Mac news in the Bodega interface, thanks to a partnership with Loop. Bodega's main draw, however, was the ability for a user, when browsing through the latest app releases and best sellers, to easily buy an app when they stumbled across something that they liked. In the Bodega interface there was always a Buy Now button that, when clicked, would take the user directly to the purchase page on the developer's website. The direct Buy Now button was a massive time-saver, as the user would not have to go searching for the app themselves and potentially lose interest along the way. Bodega understood the importance of immediacy and ease of use when it comes to purchasing a new app. Bodega had another great innovation up its sleeve. Users will often have apps on their system that are out of date. Updates contain performance and feature improvements, so not having the latest app means the user is not getting the full experience. Yet some users, for whatever reason, will always put off updating their apps. Bodega created a system where it would always check app versions for the user, automatically downloading and installing updates, so the user never has to worry about a thing. Every time a user opened an app they would know that they were using the latest version. Another challenge solved was that of missing app registration details. Keeping track of purchases is never an easy thing, but Bodega automatically stored the receipt for each purchase as well as the product registration number. All your important app purchasing info in one place was a real time-saver and offered peace of mind to users. Bodega was also just really fun to use and engage with. The user interface was well designed, and the app encouraged users to review apps and read what other users had to say about them. The advanced search functionality made it simple to find what you were looking for, something that was and still is a real headache with the Apple App Store. 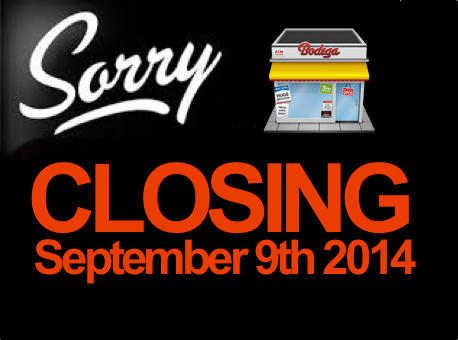 Despite these features and a devoted following, in September of 2014, Bodega was discontinued. As Bodega found out, challenging the Apple App Store is not an easy task.